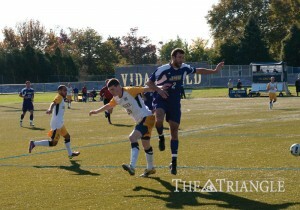 In a season of two very different halves, it was only appropriate for the Drexel men’s soccer team to finish the 2011 season on a high note. After going 1-7-1 in the first half of the season, the Dragons put up a 4-3-2 record over the second half. After the 2-0 upset win over No. 12 James Madison, Drexel traveled to Norfolk, Va. to take on No. 16 Old Dominion in the last match of the season. The Monarchs came into the match leading the Colonial Athletic Association in scoring, but they managed just one shot on goal through the first half. The Dragons managed to pepper Old Dominion with three shots on goal, all of which were saved by junior goalkeeper Victor Francoz. After the scoreless first half, the Monarchs were the first to draw blood. Junior forward Yannick Smith notched his CAA-leading 16th goal of the season in the 58th minute with a goal into the right side of the net past sophomore goalkeeper Pentti Pussinen to put Old Dominion ahead 1-0. But just as they have done throughout the second half of the season, Drexel kept fighting and scratched out a goal of its own. Sophomore midfielder Ken Tribbett scored the equalizer when he headed in a goal from his knees for his team-leading fourth goal of the year. The Dragons held the Monarchs without a shot for the rest of the regulation and through both overtime periods, but could not convert on any of their own shots. The match ended in a 1-1 draw even though Drexel outshot Old Dominion 10-2 in shots on goal. The Dragons became the only team in the CAA this year to get points out of both matches against James Madison and Old Dominion. Drexel finished the season with an overall record of 5-10-3 and were 4-5-2 in CAA play. Their 14 points in 11 CAA matches was good enough for eighth in the conference, which was a great improvement over last season’s 3-8 conference record, which equated to just six points. Early on, the Dragons struggled to score goals when two of their top scorers from last season, junior midfielder Nathan Page and senior forward Andrew Goldberg, were injured and lost for the entire season. The team scored just three goals in its first 10 matches before the offense began to click. In the final eight games, Drexel scored 11 goals and was able to hit stride. One player who excelled this season on the offensive end was Tribbett, who was recently named to the All-CAA Second Team. It is a great honor for Tribbett, a sophomore midfielder from Centennial, Colo., who led the Dragons with four goals and nine points on the year. On the defensive end of the pitch, the most consistent player this year for the Dragons was Pussinen. The sophomore goalkeeper from Tampere, Finland earned All-CAA Third Team honors for his outstanding play this season. Pussinen posted five shutouts on the season and played in all 17 matches. “Pentti really solidified himself as one of the better goalkeepers in this league,” Hess praised. “Sometimes if you take a guy from another country, it takes them a while for them to adapt to American soccer, culture and everything else. With the 2011 season over and out, the Dragons can take great pride in the way they finished the season strong. The 2012 team shows tremendous promise on paper, but Drexel knows that they must execute for a full season in order to succeed in the CAA. With the Dragons returning all of their players, next season looks to be a good opportunity for the team to challenge for a conference title. “It is obvious that we struggled in that first month trying to find a way to score,” Hess added. “We have to show that we can adapt quicker and recover when players get injured. We need to have a better response, and I think that is part of the growing process.